Honest and full of heart, this clever contemporary romance debut deftly combines utterly relatable family drama with all the sweetness and uncertainty that comes with falling in love. Amber lives by strict rules to survive her mother’s love life: Always keep your eyes on the horizon and never get close to anyone connected to Mom's boyfriends. But after they move in with Kevin, the latest of her mom's “soul mates,” the rules become increasingly difficult to follow. Kevin’s daughter, Cammie, keeps acting like Amber’s friend, even though she’s definitely not. And Jordan—star basketball player, hottest boy in school, and Cammie's best friend—keeps showing up at the most inconvenient moments. Chosen by readers like you for Macmillan's young adult imprint Swoon Reads, Rules We're Meant to Break is a charming, heartachingly real story of family and young love by debut author Natalie Williamson. Natalie Williamson is an HR person by day and a YA writer by night and nap time. She referenced Harry Potter in her first ever full time job interview, which tells you almost all the things you need to know about her. Other important things to know include: she loves her husband, daughter, dogs, and cat; she has a serious dessert problem; and she frequently Wikipedias movies and TV shows to find out if they have happy endings. 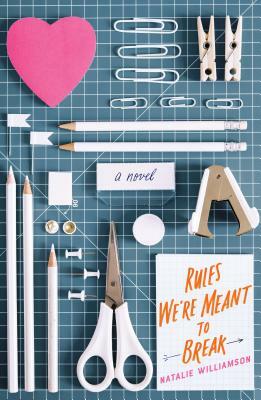 Rules We're Meant to Break is her debut novel.